For over a hundred years, wastewater technology has essentially remained the same. While other utilities have taken steps to become more energy efficient and cost effective, wastewater utilities in general have not stayed ahead of the technology curve. Because of this, wastewater infrastructure is degrading at an increasing rate, making treatment plants and conveyance systems more susceptible to failures, especially during extreme weather events. For new technologies to be commercialized, however, they must be proven and validated through extensive testing to meet increasingly stringent regulations that protect public health. Meeting these standards, which may differ across local and state jurisdictions, is complex. Additionally, acquiring equipment and securing an appropriate testing location is often too expensive for water startups to manage on their own. In response, a few cities and states are beginning to invest in water technology demonstration centers. To illustrate one effort, Georgia’s Gwinnett county began construction on its $60 million project in early October of 2018 after acquiring funding from water and sewer usage fees. The county hopes to spur economic development in the region by providing companies with testing equipment, business mentoring, education opportunities, and talent from local universities. Massachusetts currently has the infrastructure to create its own water technology demonstration center. Last year, MassCEC commissioned Woodard & Curran to study the feasibility of building or upgrading water technology demonstration centers at one or more of three following locations: the Massachusetts Alternative Septic System Test Center (MASSTC), UMass Amherst WINSSS Center, and the Deer Island Treatment Pilot Plant. While the Deer Island Plant was deemed not ready for these developments, MASSTC and UMass Amherst cases were found to be very appropriate for such a project. The most encouraging progress has been made at the UMass Amherst WINSSS Center. Announced in October, the university stated it would like to expand on the current water technology demonstration center. The picture below shows the current Center with graphic renderings of the proposed expansion. With its ability to provide startups with university-supported resources and student talent, the university hopes to initially support a pipeline of thirty water tech companies to test their equipment. Long term, UMass Amherst could create an industry leading water technology demonstration center. 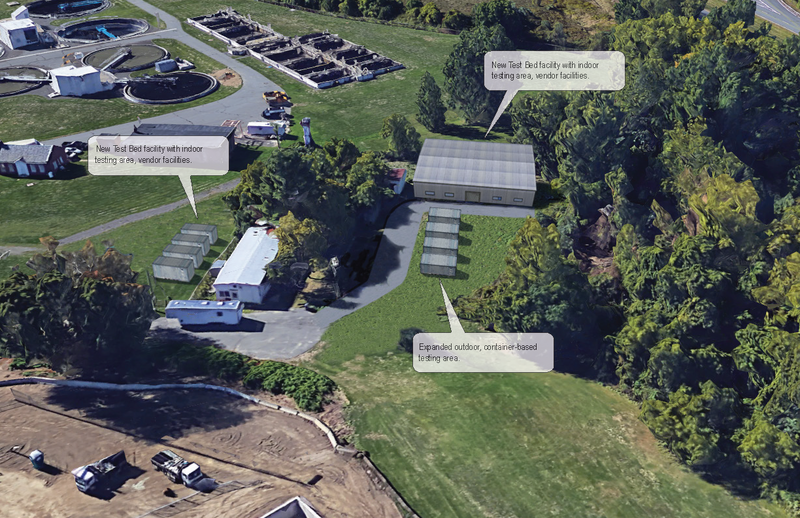 The UMass Amherst demonstration site is located directly next to the Amherst Wastewater treatment facility and can receive raw, primary, or secondary treated wastewater, providing a realistic testing environment for companies. The other promising site is at the Massachusetts Alternative Septic System Test Center in Barnstable County. Built in 1999, MASSTC offers wastewater tech companies the necessary equipment to pass EPA tests and regulations while also offering a research and development department for early startups and projects. Because of the center’s existing infrastructure, less investment is needed for upgrades to the center’s pumps, services, and member capacity, which is currently about twenty. With MASSTC’s history of supporting innovative research and technology, MASSTC, like UMass Amherst, is a site that has the potential to become a critically important water technology demonstration center in the country. Massachusetts is fortunate to have two water tech facilities in Amherst, MA and Barnstable, MA that lay the groundwork for Massachusetts to become a leader in the global water innovation industry. Read more about the feasibility study here. UMass Amherst WINSS Test Center with graphic renderings of proposed expansion.